My first thought: Hmmm… the logo is weird on all the Pages. And Wikipedia Tabs? What? Oh… so this is what a Community Page looks like. 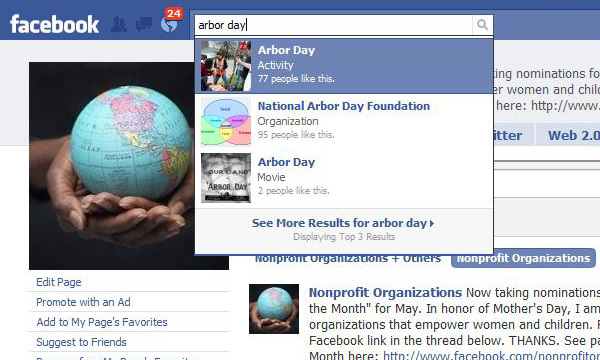 All of those nonprofits have “Official Pages” with large numbers of “Likes”, yet they didn’t come up in the Top 3 Search Results. The much less popular, out-of-their control Community Pages did. ATTN Nonprofits: Do Not Create Community Pages! 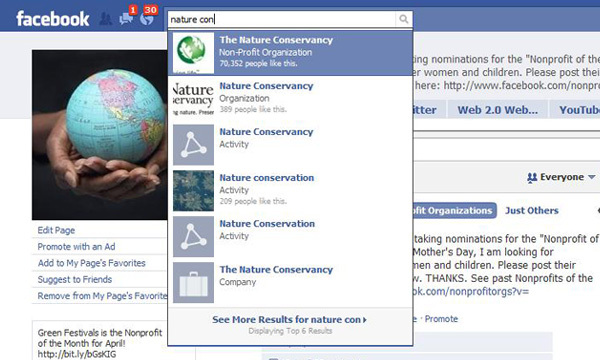 I noticed this the other day as well and agree this can undermine an org’s official page in search. Is the FB Authentication Page to which you’ve linked used to authenticate the fan page or a community page? And how do you navigate to that form on Facebook — i.e., where is it linked from? Hi… it is to authenticate a Fan Page… and you are only supposed to be prompted to authenticate when your Fan Page gets popular, but I know of two Pages – one with 50 fans, and one with 118 Fans – that were prompted. You get an email from Facebook. My guess is the two Pages prompted also had Community Pages that were generated by Facebook… that’s why they were prompted. Honestly, as I do more research… the news just gets worse and worse. I can’t even keep up with it. Found out another thing about Community Pages this morning that I hope to blog about this week. No other way to put it… Facebook has just totally screwed the very people help build the site. Nonprofits, companies, small businesses, etc. that have been promoting their Pages. I always thought that Facebook intentionally limited the Page toolset so you would have to promote the Page off Facebook… bringing them them millions of new users. Now… wow… I am even shocked as how underhanded and arrogant they are behaving. It’s really confusing, so not many bloggers have really caught on yet to what is going on… but it’s bubbling up in the business and music sectors. They are pissed. To put it lightly. 🙂 And nonprofits should be too. This is, indeed, one of the many frustrations of the Facebook Community Pages. Like you, I don’t understand why the page with the most followers/”likes” doesn’t show up in the top 3 for a search. I noticed that Bears on Patrol has a community page in addition to our fan page. I’m wondering if that’s a bad thing or not. Part of our goal is to help you and promote your efforts to provide bears to your local police. We don’t have to always be the ones working directly with the police departments. I’m thinking it’s ok to have the page which is a compilation of everyone on Facebook talking about their efforts to provide bears. I also noticed that you can link to a Wikipedia article about your cause. We don’t have one, and I noticed that Wiki doesn’t want you to write the page about your own organization. Well.. it is hard to explain, but when individuals now link/merge their personal profiles on Facebook (have you got that message from Facebook? )… it is linked to the Community Page, not the Official Page… so Community Pages are now growing faster than Official Pages. I guess it depends on how many Fans you (in the general sense) have… if you spent years, money, resources, time acquiring fans… promoting Facebook and your Page, then you should be mad as heck. Facebook “sold” nonprofits a product… and now they have done a 180 and completely undermined that very product. Read the other articles linked here from the business and higher ed sectors. They are angry… and calling lawyers. Yet the nonprofit sector is strangely quiet. Usually it is the other way around… nonprofits are the first to cry foul. I am just curious if now Community Pages will show up in Google searches over Official Pages? I’m finding this very, very frustrating! With these forced Connections, it sure would be nice for all of our employees’ profiles to link to our actual Fan Page, don’t you think? For a smaller, still-building Fan Page, it makes even less sense to me that Facebook created a (completely blank) Community Page for us. Why go to the trouble? Why not just recognize the official Fan Page? They are making more work for themselves creating a dummy-page, not to mention all of us. Why not wait until a topic has enough demonstrated activity to warrant a Community Page for discussion? Or at the very least, wait to publish the Community Page until they at *least populate it with a link to the org’s site and/or wikipedia! (This is assuming a need for Community Pages at all, of which I have yet to be convinced.) Arg! I agree. I am baffled by it, because it doesn’t even make sense for FB’s advertising model. Admins for Official Pages buy the ads… why alienate the Admins? I don’t understand their thinking on this. Will it make Admins buy more advertising if they see the Community Page is growing faster (through forced Connections which I have had a chance to blog about yet)? I don’t think so. Very strange decision on their part… unless there is more coming that we don’t know about – which is seemingly always the case with Facebook. After reading this I did a search and found that my nonprofit also has a community page. So far there is only one fan, so there is no content yet. My question is – will the Community page be deleted by filling out the authentication form? We are also very worried and unhappy about this. The Community Pages do aggregate mentions in status updates, which would be great to be able to add to our page or as a tab. But otherwise, it’s just keeping people away from one of our main communication tools. Exactly. Facebook pulled the ol’ bait and switch on all of us. I am puzzled that the nonprofit sector has had almost no reaction. Strangely silent about it. Not the case with the business sector. Thanks. Let’s remember that search functionality changes over time. Fb’s search options have always been sub-par. Social sites are not search engines. If SEO is your goal, Facebook is not a solution. Now, if you want to push out to where your users are, social sites provide a channel that can be integrated into your other channels (web site, email lists, print media, etc). Well, surprise. Is Facebook a non-profit organization? No, Facebook is for-profit. Facebook will gladly accept the traffic your organization brings, but why should Facebook care about sending you traffic? Read the TOS, Facebook doesn’t owe you anything. Understand the difference between a for-profit organization, which exists to make money, and a non-profit organization, which must obtain money to exist, but has other higher reasons for existence. Think about the fact that Microsoft and Goldman-Sachs are the major investors in Facebook. Do these companies have a reputation for playing fair, or simply for playing to win?